The mayor is just being modest here. Of course he’s willing to trade safety for convenience! In fact, he’s elevated convenience to a core value. 5. 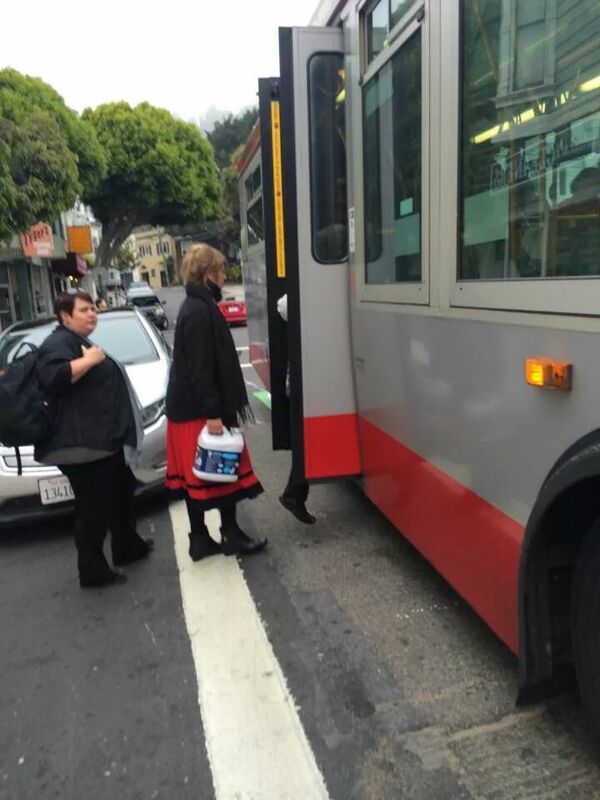 The time Mayor Lee parked in a bus stop to get a burrito. When the mayor wants a tasty burrito in his neighborhood of Glen Park, it’s no surprise he’d head straight to La Corneta Taqueria on Diamond Street. But only Mayor Lee has the panache to satisfy his cravings as conveniently as possible. You want Lee to park in a spot that’s not in a Muni bus stop, forcing passengers to board from the roadway? Sorry, you’re asking the wrong mayor! 4. 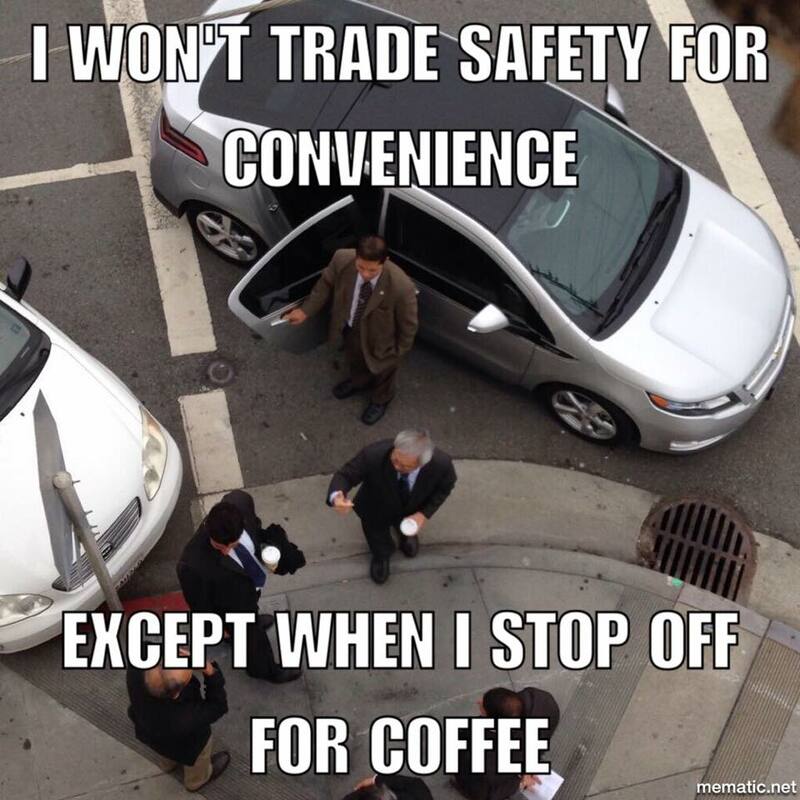 The time Mayor Lee parked in a crosswalk to visit a merchant (see top photo). SF’s merchant-friendly mayor is never one to let safe street crossings get in the way of a quick “hello.” Mayor Lee probably didn’t expect any publicity, but a watchful resident above this Outer Sunset shop was there to capture his devotion to the ultimate convenient parking spot at the expense of people who walk. Inspiring! 3. The time Mayor Lee dropped his support for a ballot measure to fund street safety improvements, then threatened supervisors for putting a similar measure on the ballot, which he later celebrated. Think Mayor Lee’s dedication to convenience only extends to the way he gets around the city? Don’t overlook his penchant for perceived political convenience. The Mayor’s Transportation 2030 Task Force should’ve known better than to recommend that he support a ballot measure to restore the vehicle license fee slashed by Governor Arnold Schwarzenegger. Did they really expect Lee to back the only proposed measure that specifically asked drivers to pay more toward transportation infrastructure, including safety improvements? Ha! Lee shot the measure down by withdrawing his support for the VLF after he said he didn’t think he could successfully raise the initial poll numbers. By backpedaling, the mayor delayed roughly $1 billion to help fill the city’s transportation funding gap over the next 15 years. Bonus points: The move undermined the city’s ability to get matching grants from the state and federal governments. Boom! Lee wasn’t done there. When the Board of Supervisors approved Scott Wiener’s ballot measure to help make up for the loss of the VLF revenue by using general funds, he threatened retribution for the six supervisors who voted for it! The supes can’t hate, though, because after voters passed the measure and raised $24 million in the first year, Lee was all about that measure. Bam! How convenient is that? 2. The time Mayor Lee repealed Sunday parking meters after a study showed they reduced car traffic. You might assume that Mayor Lee loved the convenience of Sunday parking meters. After all, during the first year they went into effect, they halved the average time drivers took to find a parking spot. Rookie mistake. Lee’s quest for convenience at the expense of safety is too sophisticated to be bound by data-based findings. You see, Sunday metering reduced car traffic, which makes streets safer, but the church lobby didn’t like it. So the mayor claimed there was a popular revolt against the policy, even though there wasn’t any record of it. Can you guess what the mayor did next? The mayor took advantage of his convenient power to appoint all members of the SFMTA Board of Directors, and successfully pressured them to repeal Sunday meters. Sneaky, Mayor Lee! But oh-so politically convenient. 1. The time Mayor Lee refused to say safety on Polk Street was more important than car parking. 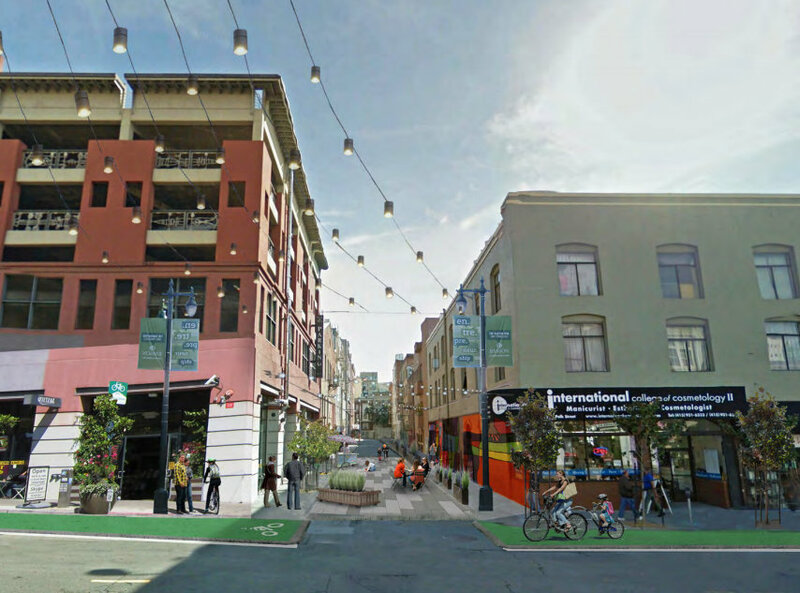 Remove car parking for protected bike lanes on Polk Street? Not under this mayor! Our modest mayor wouldn’t admit any involvement, but it sure looked suspicious when plans for a protected bike lane on Polk that would’ve replaced the parking in front of his optometrist’s office were removed from the block at the last minute. Lee’s optometrist himself even said he’d talked to him about it! You bet it does! Mayor Lee is just too bashful to say it. Thank you, Aaron, for speaking truth to power. There is a lot of greenwashing and b.s. going on here. Vision Zero and Transit First are too often not much more than a slick slogan, especially when the mayor chooses to backpedal and water things down. Thank you for consistently displaying this mayor’s hypocrisy. But nobody would take on this turkey. Even if Leno, maybe Ammiano, were to lose to Ed Lee, it would have made him dance and stick out his neck. By running with no credible opposition, he’s been given the go ahead to do whatever the hell he wants for 4.5 more years. Underscored by raising a million dollars for his campaign and spending it basically on largesse. Just a reminder. There is an election coming up. This is a prime opportunity to voice your opinion and vote against the Zero Vision mayor. Remember, not voting is the same as voting for him. Make sure you do indeed vote for the other candidates. 0. The time Mayor Lee’s SFMTA granted special permission for taxi drivers to block bike lanes for pick-up and drop off passengers. Talk about sacrificing safety for convenience…. Yeah, but Willie Brown told the chip monk it was OK for taxis to block bike lanes. Aaron, with this pithy article, you remind us all why the Fourth Estate exists. Thank you for pointing out this emperor wears no clothes. It looks like the SFMTA gets to trump CVC 21211 in SF city limits with their mere -memo “allowing” Taxi cabs to obstruct bike paths. Perhaps the SFMTA could write a similar memo to trump the CVC about Idaho style Stop-Yield law? This is identity politics at it’s finest. People who walk and ride bicycles in the city are natural allies who are both vulnerable on the streets because they aren’t surrounded by 2,000 lbs. of fast moving metal. Even framing the argument this way misses the fact that these are simply modes of travel rather than political groups. However, making this an argument of convenience of “bikers” over “pedestrians”, you split the advocates apart over nuance and can neuter their political strength. It also shows that our mayor doesn’t care about Vision Zero, except that it’s a convenient slogan. The core of the Vision Zero movement is careful data analysis. And since there is no data which suggest that the ‘Idaho Stop’ law has resulted in an increase in injuries and collisions he is ignoring one of the key principals of that effort. The fact that his letter doesn’t reference any crash data shows that this is more about emotion and politics than data. Yes, they’ve basically ordered the PCOs not to ticket a class of vehicles that violate the law. How is this is an different from asking the police to place a low priority on cyclists rolling through empty intersections? There is no serious opposition. No politician is going to raise the millions of dollars to run a campaign that he or she can’t win in order to make a point. D’oh! It’s not called advocacy journalism for nothing. I think you have to get the SFBC on board and then it’ll be OK. Given the headline, what did you expect? Another five examples where the Mayor isn’t being a hypocrite? I cannot see how that would add balance to this story. The purpose of the story is to point out the mayor is a hypocrite. Maybe you will give us an example of how you would have written that story? So what you’re saying is that apart from being a hypocrite, Mayor Lee has a cynical desire to divide cyclists and pedestrians… so presumably he may conquer both in his quest to pay no more than lip service to Vision Zero? Anybody but Lee! There are three candidates that by themselves couldn’t mount a campaign against Lee. But this mayor election is not about the other candidates. This election is all about Lee. If a majority of voters vote against him by voting for all 3 of the other candidates, mayor Lee will loose this election.